Oconee County Commissioners on Tuesday night will be asked to decide whether to allow a convenience store, a ministry college campus, and an expansion of a community-scale church, all in land zoned for agriculture. 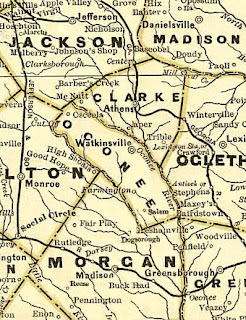 Two of the rezones are in the only part of Oconee County east of the Oconee River–a triangle of land assigned to the county when it was split off from Clarke County in 1875. The Commission’s decision on the convenience store will have impact on Athens-Clarke County residents, who live across Bob Godfrey Road from the proposed old-fashioned general store. The convenience story decision also will have impact on Oglethorpe County residents, who live a short distance east of the proposed site, which is on the southeast side of the intersection of Bob Godfrey Road and Belmont Road. None of the three counties provides water and sewer services to the area, and the ministry college says it will need both as it builds out to a 750-student campus over the next 10 plus years. The issue before the Commission–whether to grant special use permits in agricultural zoning areas--is reminiscent of the one it confronted back in January when it turned down a request to allow for a solar farm in agricultural land at the opposite end of the county near the Barrow County and Walton County lines. The least controversial of the requests for a special use permit in an agricultural zone is that by Watkinsville First Baptist Church, on Simonton Bridge Road at Norton Road just east of the city limits of Watkinsville. The church is asking for a special use for a “Community Scale Church” in the existing agricultural zone for the expansion of its campus. The church currently has buildings with a total floor area of 58,350 square feet and wants to increases that to 146,000 square feet of space in two phases. The first phase would add a sanctuary, while a subsequent phase would include a new classroom building, a chapel addition, and a children’s building. Two existing residential structures would be demolished. At the Planning Commission meeting on Feb. 20, Planning Commission member Brad Tucker raised concerns about the 40-feet-height of the new sanctuary and its flat roof, saying that was the equivalent to a big-box commercial building and inappropriate for the surrounding residential land use. The Planning Commission voted 8-1 in favor of recommending the special use approval to the Board of Commissioners, with only Tucker voting in the negative. Green Hills Farms LLC is seeking a special use to allow the Athens College of Ministry to develop its campus on just more than 100 acres on agriculturally-zoned land. The 100-acre-parcel is part of a larger tract of 189 acres that was a golf course but has been unused since 2009. The special use is only for the western portion of that acreage. Athens College of Ministry wants to build a private Christian college campus with a variety of structures and uses including a multi-purpose administration/classrooms building, living accommodations, and recreational facilities. The proposal is to use well-water and a septic system in the initial stages of development, but the campus will need water from Athens-Clarke County or Oconee County as it develops and have to develop its own sewage treatment plant if neither of the counties can provide sewage treatment capacity. 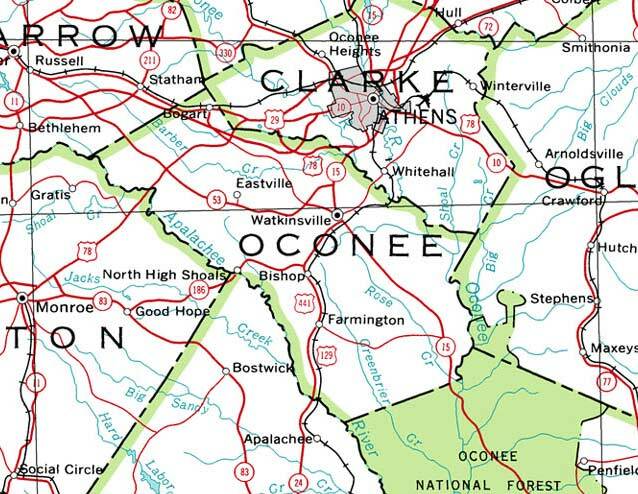 Athens-Clarke County does have water service in the general area, but Oconee County does not, and neither county has a sewage plant downstream from or even near the site. Oglethorpe County does not have water of sewer services in the area. In addition to potable water for use by the students, faculty and staff, the campus needs water for fire protection. The water and sewer issues didn’t get much attention at the Planning Commission meeting, where the concern was with the implications of a granting a special use permit on the agricultural land should the college not develop as planned. In the end, the Planning Commission recommended approval of the special use request in a 6-2 vote, with Planning Commission member Chuck Steen recusing himself. The item at the Feb. 20 Planning Commission meeting that generated the most controversy was the request by Pat and Marsha Halloran for special use approval for a convenience store without fuel pumps on the south side of Bob Godfrey Road and east side of Belmont Road on agriculturally-zoned land. The Hallorans proposed to build a general store with the “character and aesthetic of 1920s Georgia” that would not sell alcohol, tobacco or lottery or other gambling products and services. The property, in Oconee County, is close to the Wolfskin community, in Oglethorpe County, and many residents of the area said the general store would fill a community need. In fact, the Halloran property is separated from the Oglethorpe County line by only two additional properties. 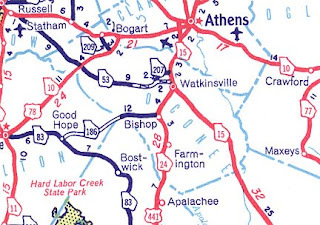 It is separated from Athens-Clarke County only by Bob Godfrey Road. Athens-Clarke County residents who spoke at the Feb. 20 Planning Commission meeting largely were concerned about adding additional traffic to the Godfrey Road/Belmont Road intersection. The Planning Commission voted to recommend the special use by a vote of 6-3. The Hallorans also are requesting approval of two special exception variances to eliminate the requirement to construct off-street parking and to eliminate the requirement for landscaped buffers between incompatible land uses. The latter results from the fact that the surrounding area, including two additional parcels owned by the Hallorans, will remain agricultural. The Planning Commission does not consider requests for special exemption variances, which go directly to the Board of Commissioners for action. The Planning Department staff has recommended approval of both of the variance requests. The staff said the “requirement to install landscaped buffers between incompatible land uses would not be practical due to the rural character of the site and the location of parcels owned by different property owners. The staff said that “Considering the location and rural nature of the site...eliminating the need to require off-street parking for this site” does not violate the purpose of the county requirements. The Board of Commissioners meet at 7 p.m. on Tuesday in the Courthouse in Watkinsville. The county’s zoning laws are compiled in what is called a Unified Development Code, which lists land uses in various zoning categories, such as in agricultural land. Included is Table 2.1, which spells out what are uses allowed by right and uses allowed by special permit. In the Watkinsville First Baptist Church, Greenhill Farms, and Halloran requests, the use being requested is by special permit, meaning that the Board of Commissioners has to grant it for it to be allowed. This also was the case when Mr. Chick Farms LLC requested a special use for a solar energy farm on Dials Mill Road on nearly 205 acres zoned for agricultural use. The Commissioners turned down that request in January, by a 3-1 vote, on the grounds the requested use was not compatible with the surrounding residential areas. Mr. Chick Farms could have requested a rezone for the 205 acres to industrial, where the solar farm would have been allowed by right. But it is unlikely the Commissioners would have approved that request, since they normally do not allow industrial zoning next to residential areas. Similarly, the Hallorans could have requested a business classification for their property. In a business zoning category, a convenience store would be allowed by right, but it is unlikely the Board of Commissioners would approve a business use on property surrounded by agricultural use. Greenhill Farms could have requested an office-business park or business rezone, where their campus would have been allowed by right, but they chose not to do so. Community scale churches, which is what the Watkinsville First Baptist Church is, can operate in a variety of zoning categories, but only with a special use permit. Had the Hallorans wanted to install fuel pumps at their convenience store, they could not have applied for a special use permit. The Unified Development code specifies that a convenience store with fuel pumps can only operate on property zoned for business. The concept of a convenience store, even without fuel pumps is evolving, with Dollar General, Family Dollar and Dollar Tree, among others, offering concepts of that sort. Dollar General has a Dollar General Market in Statham that does not sell fuel. 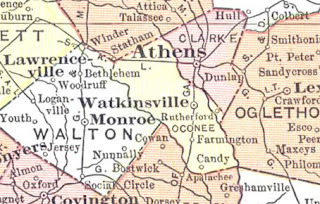 The triangle of land on the eastern side of the Oconee River where the convenience store and ministry campus are being proposed has been part of Oconee County from its beginning, according to the Digital Library of Georgia. 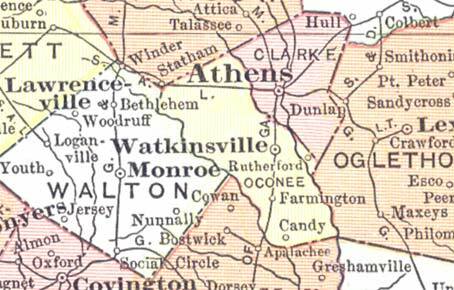 In 1871, the legislature moved the county seat for Clarke County, which then included what today is Oconee County, from Watkinsville to Athens. 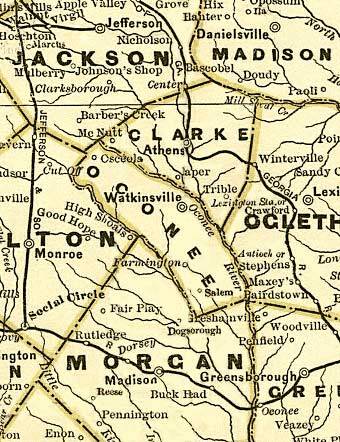 Four years later, on Feb. 25, 1875, after residents of western Clarke County pressured the General Assembly, it created Oconee County from that western section of Clarke County. "Beginning at a point immediately opposite the mills of James H. Thompson, on the Jackson line, and leaving said mills in said new county, thence a straight line to the old saw mill site of Nathaniel L. Barnard, on McNutt's Creek, thence down said McNutts' Creek to its junction with Barber's Creek, thence down said Barber's Creek to its junction with the Oconee River, commonly called Middle River, thence down said river to the junction of the two Oconee rivers, thence down the Oconee River to Barnett's or Neal's Bridge, on said river, thence with the public road to Big Creek Church to the Oglethorpe county line, thence with the lines of the counties of Oglethorpe, Greene, Morgan, Walton and Jackson to the starting point . . . ."
The first map in the archive to show that triangle is from 1910. The maps got better, and the triangle more obvious, as time progressed. Question: Will Oconee County have any land left zoned for agriculture if the Board of Commissioners continues to approve special use permits in agricultural zoning areas?? 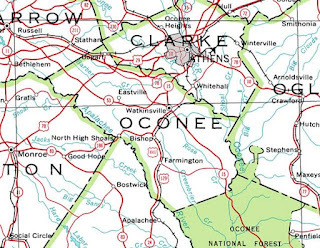 It's the big picture question facing Oconee: Will Oconee retain at least some of its agriculture heritage, or will it go the way of Gwinnett (strip malls, endless chain stores & restaurant, and identity-less subdivisions)? Smart planning can keep agriculture and still allow development in a smart, proactive manner. Hodgepodge, wily nily growth leads down a direction with no way to go back. Even though this land is listed as agriculture I think it was a golf course and probably would never be used for either ever again. Um, isn't that what the county has become already? I remember before 316 was in and the north party of the county was beautiful and productive agricultural land. The countless identity-less subdivisions and strip centers have been with us for 20+ years. Death by a thousand cuts has turned Oconee County into a mini-Gwinnett already. You are correct. As noted in the post, in the section on the ministry college, the golf course has not been active since 2009. According to the staff report for the rezone, the property was zoned A-1 (Agricultural) with the adoption of zoning in Oconee County in 1968. The property had been developed as Green Hills Country Club, a golf course and country club, in the 1950s. So the golf course use preceded the zoning classification. Under the current Unified Development Code, a golf course could be allowed in an agricultural zone with a special use approval.